Affordable Digital-SLR cameras have transformed the world of digital photography. Not only have they given credibility to digital photography in the professional world but, more importantly, they have released a world of photographic possibilities for anyone looking to get the most out of their digital camera. 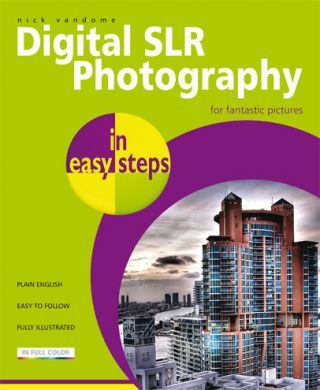 Digital SLR Photography in Easy Steps begins by demystifying digital cameras and explaining their functions and capabilities. It also shows how to create a robust workflow for downloading, cataloguing and editing images taken with a digital SLR camera. But Digital SLR Photography in Easy Steps is much more than a guide to the functions and use of digital SLR cameras. One of its main purposes is to show how to use these powerful and flexible cameras to improve your creative skills, so that you see yourself more as a photographer rather than someone who just takes snapshots. Covering areas such as exposure, shutter speed, aperture, lighting and focusing the book shows how this technical knowledge can be harnessed with a digital SLR to produce images of which you will be proud. In addition, areas such as landscapes, architecture and people are looked at so that you can use your digital SLR to maximum creative effect. There has never been a better time to buy a digital SLR in terms of affordability, quality and functionality. Coupled with Digital SLR Photography in Easy Steps you will be able to enhance your photographic experience, while producing stunning results.